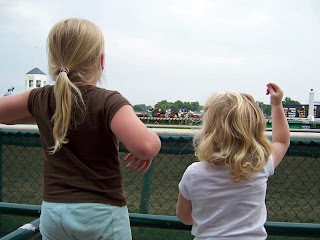 Last week my Mom took the girls and me to Lexington, Kentucky to visit some of the famous racehorses of our time. This is the second trip we have taken together to Kentucky and this one was just as magical as the first. As you probably already know, I am a total horse-lover who has passed the horse-lover gene on to my oldest daughter, Dylan. I swear, she lives and breathes horses. She remembers the names of famous racehorses and was just as thrilled as I was to meet Monarchos (2001 Kentucky Derby winner), Thunder Gulch (1995 Kentucky Derby Winner), Fusaichi Pegasus (2000 Kentucky Derby winner), and Smarty Jones (2004 Kentucky Derby winner). Three Chimneys Farm the day they received the call that Silver Charm (1997 Kentucky Derby winner) was going to be inducted into the Hall of Fame! Claiborne Farm is truly an amazing place. In their horse cemetery are buried Secretariat (1973 Triple Crown winner), Gallant Fox (1930 Triple Crown winner), and Omaha (1935 Triple Crown winner). Claiborne also owned Whirlaway (1941 Triple Crown winner) but he was buried in France. The Triple Crown is undoubtedly the most difficult feat in all of Thoroughbred racing. Only 11 horses have captured the Triple Crown, while 42 others have finished only one win shy of the honor. Claiborne can claim four Triple Crown winners! I’m so amazed. We loved visiting Claiborne... and Ioved meeting Monarchos! 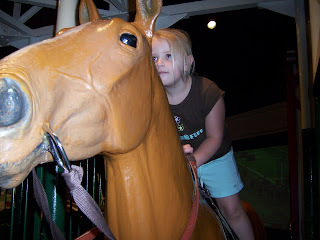 We also spent a day in Louisville to visit Churchill Downs and the Kentucky Derby Museum. The museum is amazing and a must-see if you're in Kentucky. 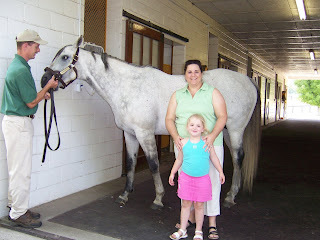 Dylan specifically asked to visit becasue she remembered "riding" racehorses from our first trip. She was not disappointed. She says she wants to be a jockey when she grows up. I love the history. I love the horses. And I’m so grateful to my Mom for giving us this precious memory! we have never been around those kinds of horses....but they are beautiful. All my little girl knows is My little Pony! Oh what fun! I want to go there! 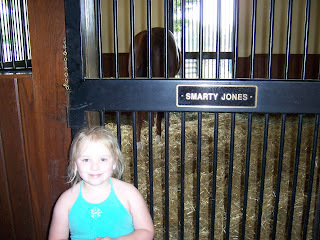 We were big Smarty fans, he was local to us. Beautiful pictures! Sooo adorable! Looks like you all had so much fun. I ADORE Lexington and the Horse Park! Glad to see your beautiful girls having such a wonderful time - it is a wonderful place to take children! Sounds like a really fun trip. Things have been psycho crazy busy here. I am hoping that stuff slows down soon. HOwever i seriously doubt it. Love ti you and the family.